March | 2011 | What about this? can wait till tomorrow . . .
our sorrow . . . So quiet down cobwebs . . .
dust go to sleep . . .
Over thirty years ago, when my eyesight was keener and my fingers more nimble, I meticulously stitched those words into a wall hanging for my sister who was awaiting the birth of her first child. A few years passed and I had children of my own. And even though I didn’t have a little wall hanging to remind me of the sentiment, I never forgot the message behind those few simple words. As each of my children entered the world and grew up in what seems like a nanosecond, I experienced first hand how “babies don’t keep.” Being mindful of the words I once stitched, I set my priorities early on and quit my job to care for my children. My goal was to raise bright, responsible, and caring individuals in the relatively short amount of time I had them at home. Moments, like watching their first wobbly steps, saying goodbye to them at the kindergarten gate, feigning calm during their frightening driving lessons, and dropping them off at college, etc., were bittersweet ones. Recognizing fully that each milestone reached was just another step towards my goal, I also acknowledged that it was another step towards their independence. I knew we would never pass this way again and nothing was more important to me than them. That’s not to say, though, that I never lost perspective. There were times that I turned into an occasional, PMS-possessed, crazed mom! When the weariness of refereeing between bickering kids and when the endless washing, cleaning, cooking and driving devoured my life, I was hard-pressed to remember the words of the poem. But somehow these words would gradually float back into my consciousness and help me adjust my perspective. The kids are all out of the house now and, thankfully, they still call to chat and ask for recipes. They’re off doing their own things, but I still think about the “Babies Don’t Keep” poem. I’ve taken that poem and transformed it into a message that applies to something broader – life. Life is all about choices and priorities, right? For me, my family and friends are high priorities, but my house, not so much. I’ll never be a tidy housekeeper like my mom or some of my friends, because having a clean house just isn’t important to me. My house isn’t filthy, by any means, but there’s huge room for improvement! But because I’ve learned that kids grow up fast and, more importantly, I’ve learned that life passes by much too quickly, I do the things I want to do and not have to do! my sorrow . . .
so let there be cobwebs . . .
dust bunnies mate . . . He: What’s this in the freezer? Me: Oh, it’s a container of hailstones. Me: Yeah, I saved some for you. Me: Because I didn’t want you to miss out. He: Miss out on what? Me: Miss out on seeing the hail! We had two huge hailstorms pass through and I wanted you to see what you missed! Me: Because I love you and like to share things with you! Why else?! He: Can we throw it away now? It’s obvious from this conversation that I was the only one in my family excited by the powerful weather that passed over us this week. In the midst of thunder cracking and hail flying, I crazily grabbed my camera and ran outside to see if I could capture the event. Photos don’t do the forces of nature justice. Only white streaks can be seen in the photos as the hails stones were hurled to the ground and frankly, without the sound effects of the roaring thunder and the pounding hail, it’s just not the same! That is how I rationalize saving the hailstones for my husband – he had to see them with his own eyes! Have you ever wondered how hail stones are formed? 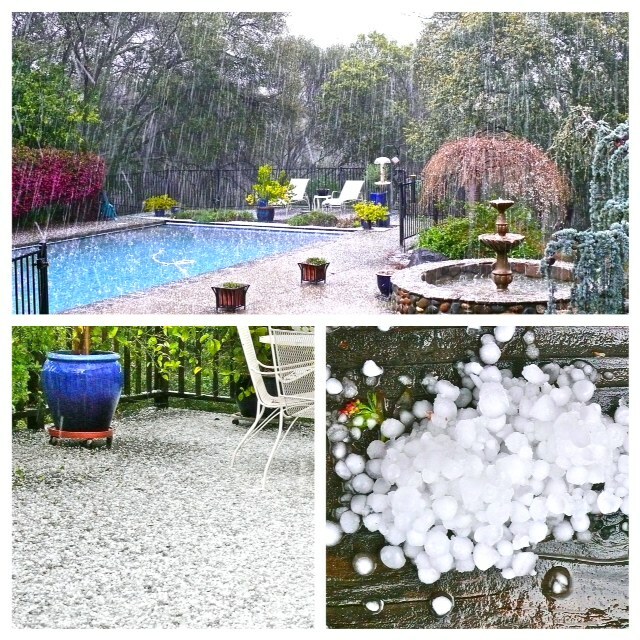 According to Wikipedia: Unlike ice pellets, hail stones are layered and can be irregular and clumped together. Hail is composed of transparent ice or alternating layers of transparent and translucent ice at least 1 millimetre (0.039 in) thick, which are deposited upon the hail stone as it cycles through the cloud multiple times, suspended aloft by air with strong upward motion until its weight overcomes the updraft and falls to the ground. Now you know! Earth From Above is a collection of incredible photographs taken across six continents by aerial photographer Yann Arthus-Bertrand. I often read articles from the Men’s Health Magazine and found this one full of helpful suggestions. After reading The 100 Best Fitness Tips, I am more motivated than ever to work out! And that’s saying a lot! #5 – Who Holds You Back? One piece! 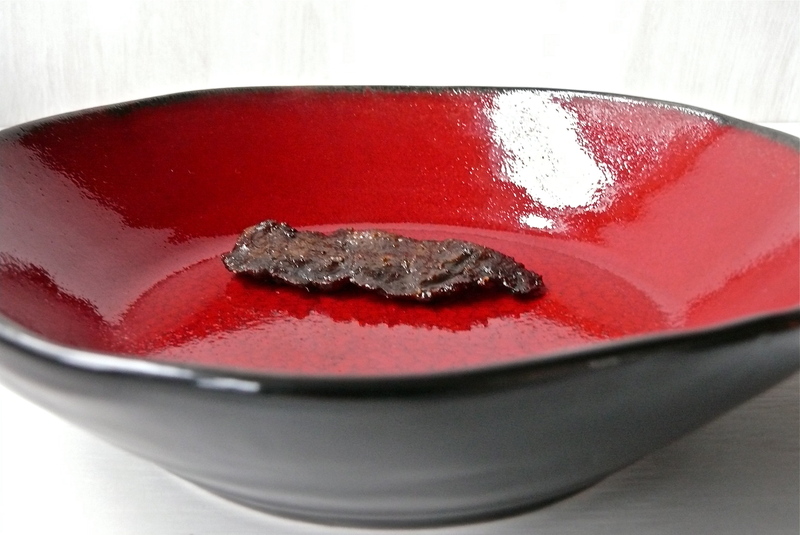 One tiny little piece of homemade Chinese-style beef jerky remained in the bowl. In the quick ten minutes it took me to wash the dishes, the entire contents (minus one piece, of course) had been devoured by He-Who-Shall-Not-Be-Named! Noting the digestive-inhalation that just occurred, I considered my first foray into making beef jerky a success! 1. Rinse meat and blot dry. Place completely flat in zip-type plastic bag and freeze for about 45 minutes. 2. Make the marinade with the remaining ingredients. Set aside. 3. Remove meat from the freezer and take out of bag. On a cutting board slice the meat into wide strips across the grain and put into a large bowl. The pieces should be no thicker than 1/8th-inch thick. 4. Pour the marinade into the meat bowl. With your hands, carefully mix the two, making sure that all sides of the meat slices are evenly coated with the marinade. Cover bowl with plastic wrap and refrigerate for at least one day. 5. When ready to cook, preheat the oven to 250 degrees F.
6. Cover baking pans with foil. Place either broiling racks or cooling racks into the baking pans. This allows air to flow around the meat. Spray racks with a vegetable spray and place slices of meat in a single layer on the racks. The slices can touch, but should not overlap. 7. Bake for 45-55 minutes. Remove from oven and let cool completely. 1. Chinese-style beef jerky is a little sweeter and stickier than conventional western beef jerky. 2. The best prices for flank steak were at Sam’s Club, Winco, and Costco – in that order. 3. These are optional procedures – Halfway through the baking time I removed the baking sheets from the oven and poured off the meat juices that had collected in the bottom. I wanted the meat to bake and not steam. At this point I also turned the slices of meat over. 3. Because I like my beef jerky peppery, I sprinkled some freshly ground black pepper over the raw meat slices prior to baking and again at the halfway point after flipping them over. 4. How to tell when meat is done: The slices will shrink by about 50%. The color should be dark brown and should be evenly colored, but not burnt! You’ll know when you see them. 5. After reviewing many other beef jerky recipes, I found this one to be relatively easy. So easy, in fact, that I made three batches in over two days! Get out the umbrellas again! Another weekend of rain is approaching! As I sat at my desk this morning thinking about the rain, my thoughts turned to umbrellas. And while thinking about umbrellas, I happily remembered some umbrellas I photographed while in Italy. 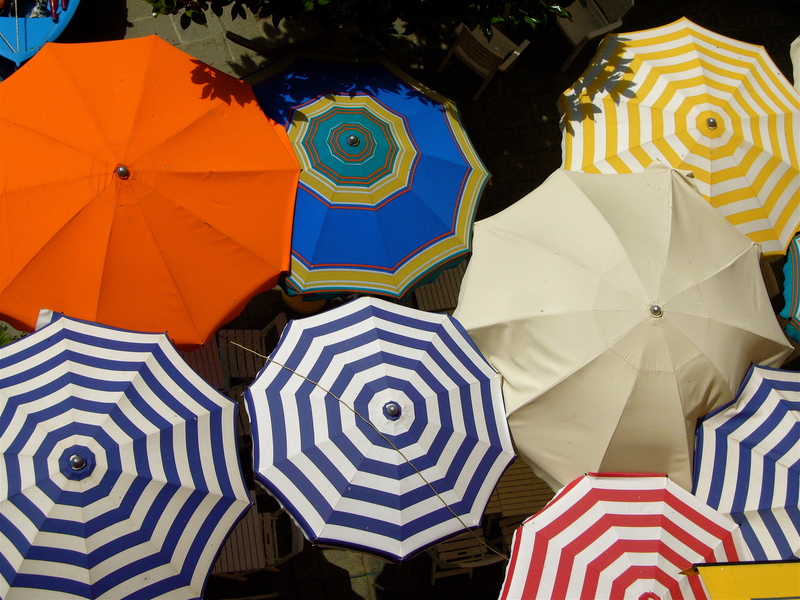 The thought of them instantly transported me to a beautiful summer day in Cinque Terre where I snapped photo after photo of these colorful, sun-loving umbrellas from the window of my hotel room. Reliving that moment made me smile and forget about the dismal weather outside. But despite my whining about wet and soggy days, I am ever appreciative of having a roof over my head and a loving family around me. All is put into perspective, when considering the misfortune and struggles of others. Before and after satellite photos of the areas most hard hit by the earthquake and the ensuing tsunami in Japan tell a horrible story of devastation that words inadequately try to describe. To view the before and after photographs from this New York Times interactive presentation, slide the center bar to the right or left to see entire photographs. After selling lemonade for three and a half hours, a group of nine-year-old children in Northern California raised over $300 dollars to help the Japanese. And out of the mouth of babes, one of them very wisely said, “You can do anything from any place you are.” Life’s teachers and life’s lessons come in many different forms and sizes. Want to play a fun and challenging game that will expand your vocabulary? Here’s how to play Knoword: When you begin, you will be given one randomly generated dictionary definition along with the first letter of its corresponding word. You must fill in the rest of the word to experience a gain in points and an added time bonus. You will start off with one minute before the game ends, and every word is an opportunity to extend your time. If you’re ever stuck on a word, just hit the skip button and a new puzzle will present itself. If you’re able to string together correct answers, you will notice your Word streak counter increasing. You can accumulate badges and additional points by achieving certain amounts of consecutively correct words… How far can you get? Even though I’m not very good at this game, I find it addictive! 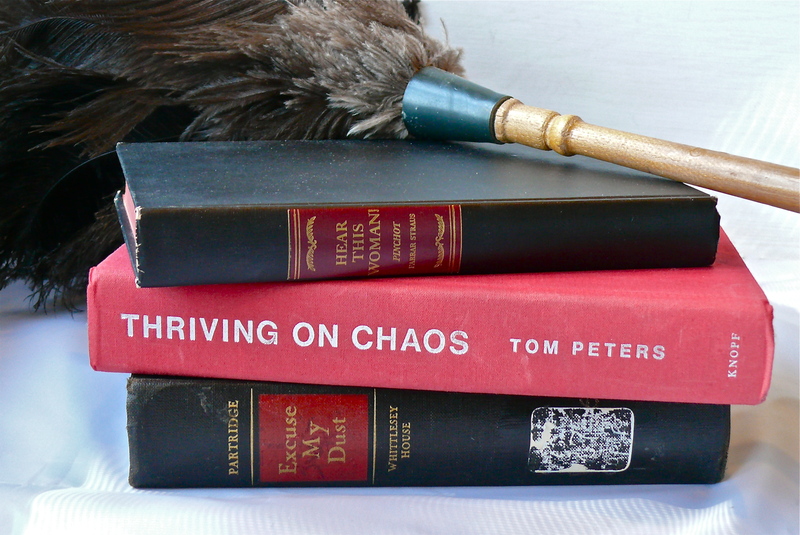 Looking for ways to become more productive? Perhaps you have to look no farther than your own diet. This article provides an easy-to-read chart which lists 100 foods and the ways they affect our bodies and ultimately assist our production. Wow, I never knew that pound cake improves digestion and sleep! Stay dry and safe this weekend! What’s not to like about a cake that has all the delicious components of a bakery-fresh eclair, but is easier to make? The rich chocolate sauce, the fresh whipped cream, the creamy vanilla custard, and the light, cream puff pastry each, in their own right, are special, but combined they are divine! 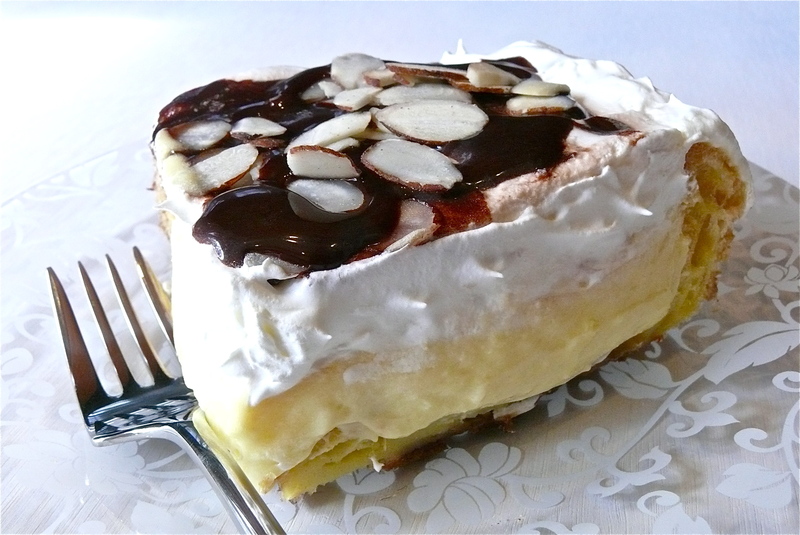 I made this scrumptious Eclair Cake for my son’s birthday and everyone loved it from top to bottom – as evidenced by some serious, post-devouring, fork licking! 2. Put water and butter in a medium saucepan and bring to a boil. 3. Reduce heat and stir in flour all at once. Keep stirring until mixture pulls away from the sides of the pan. 4. Remove from heat and stir in one egg at a time, beating well after each one is added. 5. Spread evenly into a greased 9 x 13-inch pan. 6. Bake for 20-30 minutes until puffed up and golden. Cool. 7. While crust is cooling, prepare filling by mixing the cream cheese and the dry pudding mix together. Slowly add the milk. Batter will be thick and smooth. 8. Spread filling on cooled crust. 9. Spread whipped topping or whipped cream over filling. 10. Drizzle chocolate syrup on top. 11. Refrigerate to set and until ready to serve. 1. The base layer or crust is made exactly like cream puff shells are made. The only difference is that the batter is spread out in a pan instead of being dropped by teaspoons onto a baking sheet. 2. For the whipped cream layer, I used 50 percent whipped topping and 50 percent fresh whipped cream. First I whipped the cream and then gently folded in the thawed whipped topping. 3. Instead of using a chocolate syrup, I used a hot fudge sundae sauce that was not overly thick or too heavy. 4. I lightly toasted almond slices in the oven and let them cool before sprinkling them over the cake top. 5. Another way to decorate the cake top would be to drizzle the chocolate sauce in rows over the whipped cream and then drag a knife or toothpick through the rows of sauce to create a marbleized appearance. On a day when the sun failed to shine, Mourning Doves gathered on tangled branches of a weeping cherry. 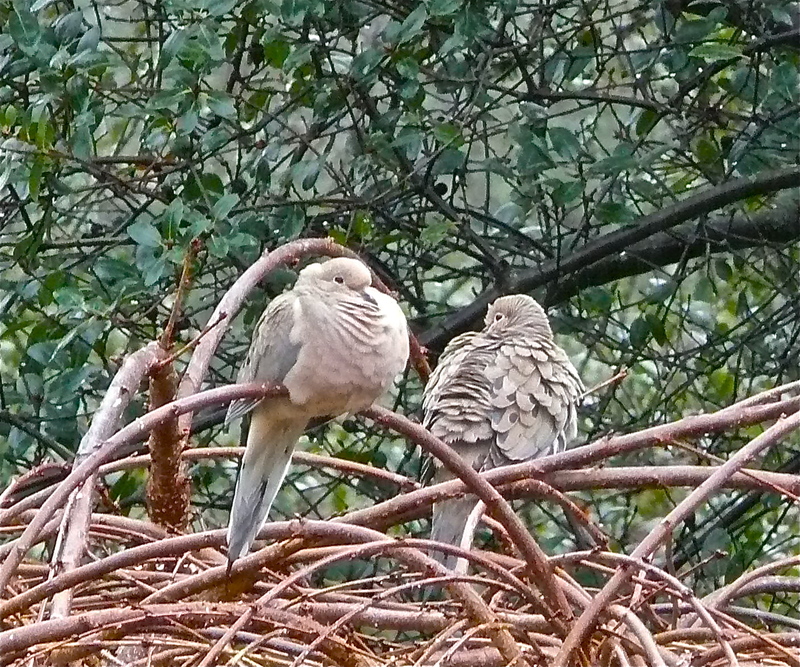 With feathers fluffed and appendages pulled in tight, they longed for the warmth of each other, but found the distance between them too great. As I read over these sentences, I’m thinking about how to improve them. They need to be more descriptive, yet tighter. Here’s my challenge to you – send me your best, brief description of or story about (three sentences or less) the photo above and I’ll share some of them in an upcoming post! Give it a try . . . it’ll be fun! Feeling inspired now? Go to One Sentence and challenge yourself to submit a sentence or just enjoy reading others’ efforts. You probably already save trees by carrying your own grocery bags into the market. Another way to save trees is to decline printed catalogs. It seems every time I pick up my mail, it’s loaded with catalogs that just end up in my recycled paper bin. According to an article in Earth 911, Nineteen billion catalogs are mailed out to American homes each year. The production of these catalogs requires 53 million trees, 53 billion gallons of water and emits 5.2 million tons of carbon dioxide. While some send catalogs to the trash instead of their recycling bins, all municipal recycling programs accept catalogs. One morning after unsubscribing to a bunch of email solicitations on my computer, I took a few minutes to make calls to companies that send me catalogs. I informed them that I shop online and requested that my name be removed from their catalog list. Get the word out! #3 – On the Tip of Your Tongue? Ever have moments when you’re talking to someone and there’s a word on the very tip of your tongue? Try as you may, your brain cannot conjure it up? Tip of My Tongue is a site that can help you during those frustrating moments. Type into the text boxes what aspects of the word you know and it provides a list of possible words for you! Photographs do not need words; they inspire them. Here’s a photo you can escape into when you need a “breathe deep” moment. #5 – Rich or Poor? A while back I wrote a short piece called Got Lemons? for a Friday Fresh Five! post that started me thinking about this fabulously versatile fruit. If your lemon tree graced you with a bounty and you’re trying to figure out what to do with them, you’re in luck. I searched the internet and created a list of thirty ordinary and extraordinary uses for lemons. If you are fortunate enough to have Meyer lemons, which are slightly sweeter than regular lemons, there are some wonderful culinary suggestions to try. Limoncello, anyone? 1. Make homemade lemonade with this basic syrup recipe: 1 cup lemon juice, 1 cup sugar, 1 cup water. Dilute syrup to taste with water or soda water and add ice. For added flavor, include a bit of chopped crystallized ginger or fresh mint leaves or some fresh fruit. 2. Highlight your hair by mixing the juice of one lemon with one teaspoon of salt and apply to your hair with a comb. Get out into the sun for a couple of hours. Because of the drying effects of this mixture, do not use this too often. 3. Infuse your favorite olive oil with Meyer lemon peel: Warm a cup of olive oil and the peel from 2 lemons over very low heat for 15 minutes, then allow to cool for half an hour. Strain and pour into a bottle with a stopper. 4. Exfoliate and clean your feet – mix up some lemon pulp and brown sugar and rub. Rinse and moisturize. Repeated use of lemon juice can whiten toenails that have been yellowed by nail polish. 5. Roast quartered slices of Meyer lemon with olive oil, rosemary and whole shallots; serve simply, with slices of grilled bread. 6. Sooth a sting by mixing the juice of half a lemon with water and apply to area. 7. Stuff the cavity of a chicken with lemon and onion wedges before roasting it. 8. Freshen up your dishwasher by placing half a lemon onto one of the spikes before you run a wash cycle. 9. Squeeze the juice from lemons and freeze it in an ice cube tray; once frozen, store the cubes in plastic bags in the freezer. 10. Freeze lemon zest. Zest lemons before juicing them; freeze zest in a small, plastic bag or a small, airtight container. Use in salad dressings, soups, roasts, pasta dishes, seafood, dips, baked goods and more! 11. Make Meyer limoncello by steeping lemon peel in a bottle of vodka for two weeks. Then strain the infused vodka, mix with simple syrup and more vodka, and bottle the result. 12. For the perfect cold remedy, add the juice of half a lemon and a pinch of cayenne to a strong pot of tea. 13. Make a lemon candlescape: Cut lemons in half crosswise. Cut a small bit off the ends to create flat bottoms. Carefully ream out juice; scrape shells clean with a spoon. Place a small votive or tea light in each shell, carefully set in a pretty bowl, fill with a small amount of water, and light candles. 14. Relieve dry and achy hands by massaging them with a mixture of lemon juice and olive oil. 15. Make Meyer lemon vinaigrette with extra virgin olive oil, Meyer lemon juice, a splash of champagne vinegar, sea salt, cracked black pepper and a little lemon zest. 16. Slice a few lemons and put them into your bath with a sprinkle of lavender and rosemary. 17. Perfume your sugar bowl by stirring strips of lemon peel down into the sugar. 18. Dry lemon slices for decorations or potpourri: Cut lemons crosswise into 1/8-inch-thick slices. Leave any seeds in place. Discard ends. Place on wire rack in baking sheet. Dry in 170-degree oven 4 hours. Remove; leave on rack to air dry. 19. Rinse your mouth with lemon juice and then swallow it for longer-lasting fresh breath. The citric acid in the juice alters the pH level in your mouth, killing the bacteria that cause bad breath. Rinse with water after a few minutes, because long-term exposure to the acid in the juice can erode tooth enamel. 20. Make a lemon Bellini with Prosecco, Meyer lemon juice, a little simple syrup and strips of peel. 21. Hollow out the interior of whole Meyer lemons, fill them with Meyer lemon ice cream or lemon sorbet. Freeze. 22. Ant-proof the kitchen with lemon juice. Squirt lemon juice on thresholds and window sills. Squeeze lemon juice into any holes or cracks that the ants are entering. 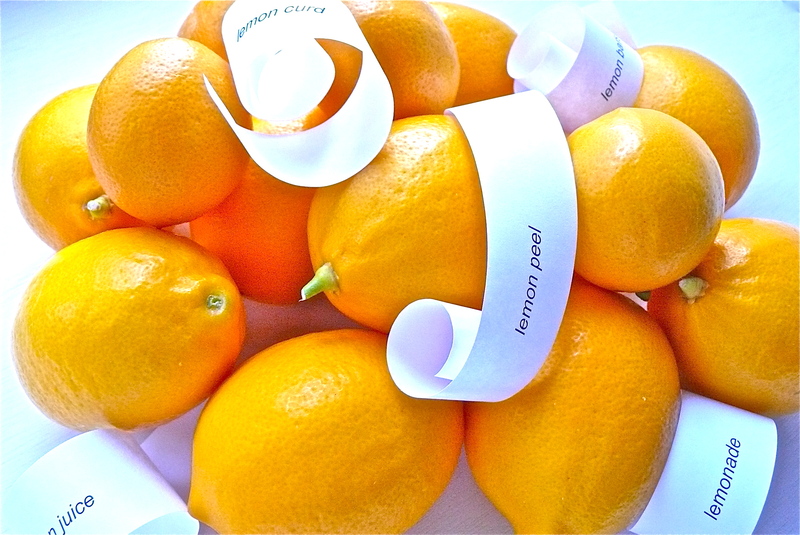 Scatter small slices of lemon peel around door entrances. Ants do not like the lemon fragrance and will not enter your home. Lemons are also effective against roaches and fleas. Reader’s Digest suggests a mixture of ½ gallon (2 liters) of water and the juice and rinds of four lemons. Wash the kitchen floor and the counters with this mixture and watch the insects leave. 23. Make a dipping sauce for grilled fish or shrimp from Meyer lemon juice, fresh chopped cilantro, basil and mint, minced garlic, ginger and chilies, and fish sauce. 24. Lemon juice is a mild alternative to bleach. Soak colorfast garments in a mixture of baking soda and lemon juice for ½ hour prior to washing. Lemon juice is much safer than bleach for whitening delicates. 25. Top blueberry pancakes with a spoonful of Greek yogurt and grated Meyer lemon zest. 26. Remove tough food stains from your cutting board by rubbing with lemon juice and baking soda. This will also kill germs and freshen the board. 27. Remove warts by applying lemon juice to the site daily until the wart falls off. 28. Potatoes, rice, and cauliflower will stay white by squeezing a teaspoon of fresh lemon juice into the cooking water. 29. Make those dull aluminum pots and pans sparkle. Rub the cut side of half a lemon all over them and buff with a soft cloth. For copper pots, rub them with a paste of juice and salt; rinse well with clear water; dry with a clean, soft cloth. 30. To clean cheese off of a grater, rub half of a juiced lemon over the grater.